Mumbai famous street food is Pav bhaji they also serve dosas too with the same filling. I have shared Pav Bhaji recipe with step-wise pictures earlier in my blog. So here i am linking the making of bhaji and just posting the making of the dosa with the vegetable Bhaji. Click Here to get the Bhaji preparation. I have to say this combination is so delicious. This is one of the tastiest vegetarian delicacies. A real treat for vegetarians. A filling meal you could make this as a breakfast, lunch or even a best choice for brunch. 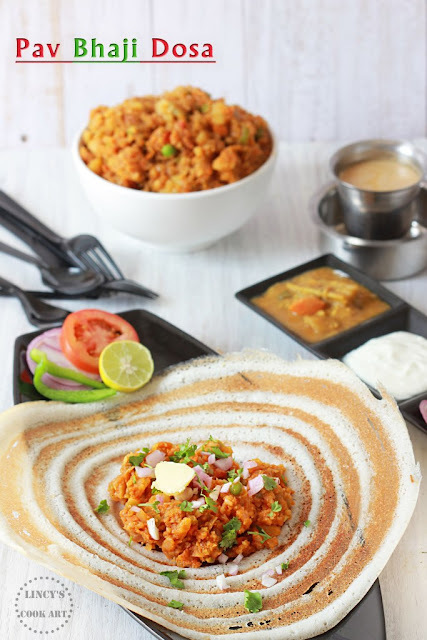 You could make this dosa with the leftover bhaji next day morning as a breakfast too. I have used very less butter to make it healthy. You could add more butter to increase the taste of the dish. Heat oil in a pan and grease the pan and add the ladle full of batter and spread as concentric circles. Drizzle half a teaspoon of oil and roast the dosa. Once the top of the dosa get cooked add a big scoop of Bhaji at the cente of the dosa. Once the dosa becomes crisp add the chopped onion, coriander leaves and a piece of butter and close the dosa as you like and serve hot with a lemon wedge. You could make this as a dosa roll too and cut diagonally and serve.